Cambridge pavers are manufactured stones formulated with an additional concentration of extra dense concrete. The armortec coating on top is made from sand granules, extra dense concrete and color that enhance the strength and wear-and-tear resistance of these pavers. Factory manufacture of these pavers occurs in controlled conditions assisted by the application of vibration and pressure. The result is a strong concrete which can be prepared into various shapes. There is a wide variety of colors, shapes and patterns available for homeowners to choose from when constructing interior or exterior designs. These pavers are so popular because of their decorative value and aesthetically pleasing effect they have on applications such as patio’s, pool surrounds, walkways, driveways, pedestrian plazas, and parking lots. 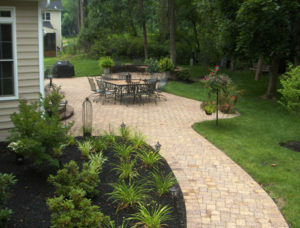 The most common Cambridge paver patterns are derived from square and rectangular-shaped pavers. These patterns include 45 and 90 degree Herringbone, basket weave, Running Bond, and whirling square. However because of there is a variety of shapes and sizes, more modern and innovative patterns have been utilized nowadays. Contact us today @ Orlando Outdoors!